Devlin “Trace” Tracy is hired by his former employer at an insurance company to protect a freewheeling actor on the set of his latest film. Trace’s office is above Bogie’s Restaurant, which is frequented by mystery writers and other P.I.s; Trace says, “Now, Bogie’s is getting out-of-town trade too. Only about a week before, there was this private detective from Boston who stopped in. He had a quiche cookbook under one arm and he ordered some kind of Yugoslavian beer and got drunk after two sips and then wanted to talk to the bartender about the meaning of courage.” Detectives Ed Razoni and “Tough” Jackson investigate the hit-and-run murder of a man mistaken for the actor due to the star giving him his jacket. 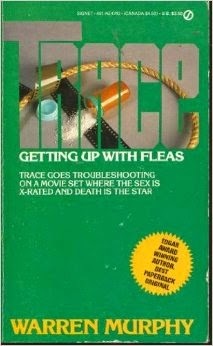 The Boston private detective is Robert B. Parker’s Spenser, though Trace is probably exaggerating his behavior somewhat. Murphy wrote a series of novels about Detectives Razoni and Jackson in 1973-1974. Trace first met the duo in Too Old a Cat, which I covered in a previous post.